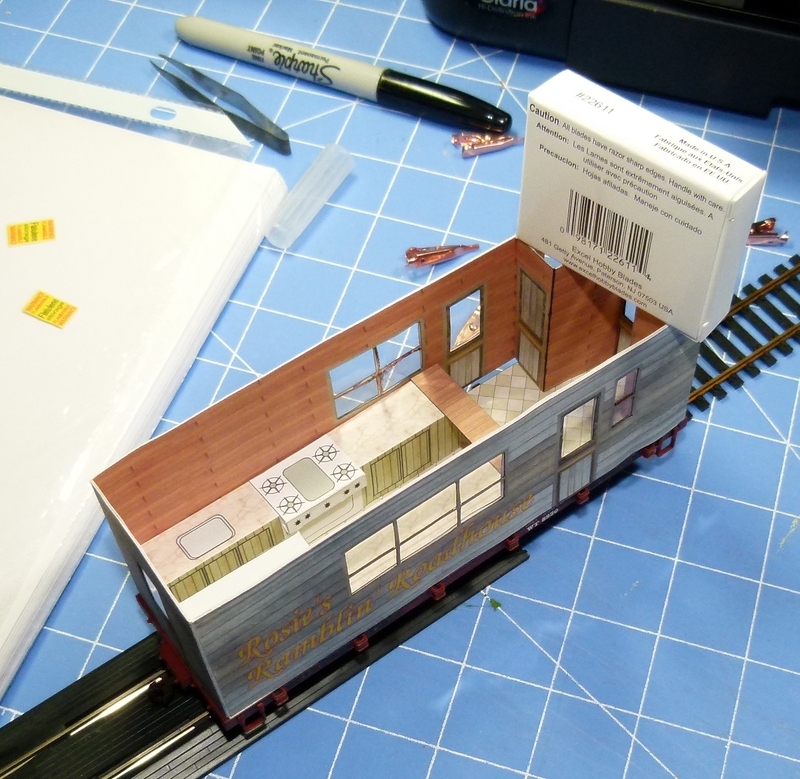 One of the members of The Railroad Line Forum recently posted a challenge. Since I already had an idea for an unusual application for one of the basic Bachman On30 flat cars, I decided to join the fray. 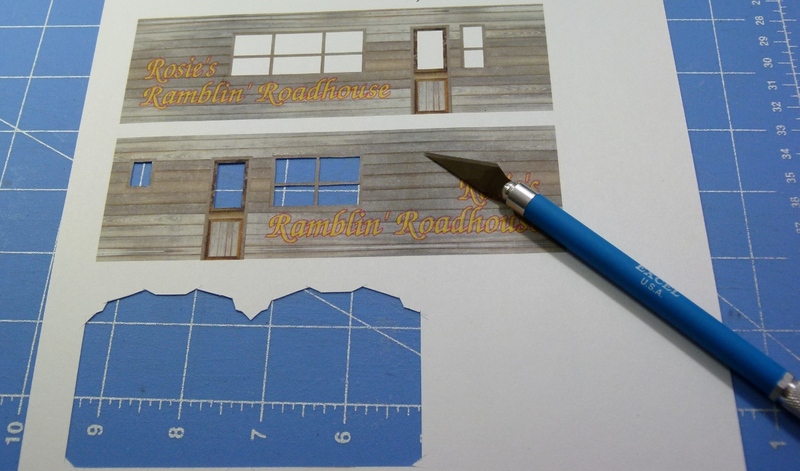 Rosie’s Ramblin’ Roadhouse will be my entrant. First off, a little background. The railroad I’m working on is based on a science fiction novel that I’m writing. It’s a narrow gauge line serving a couple of coastal towns on a colony planet in another solar system. The tale takes place in the early years of the colony, when their own industries are still in development and there is a odd mixture of older engineering for reliability and newer designs where safety is a primary concern. Rosie and her husband, Ed, were among the first colonists. He was a railroad man at heart and was among the few dozen who were present for the inaugural run of the Bode’ and Oh Sheetz RR. Unfortunately, he and their only son, were killed shortly after the party. Their friends and coworkers worried about Rosie’s empty nest but they hadn’t counted on her resilience. 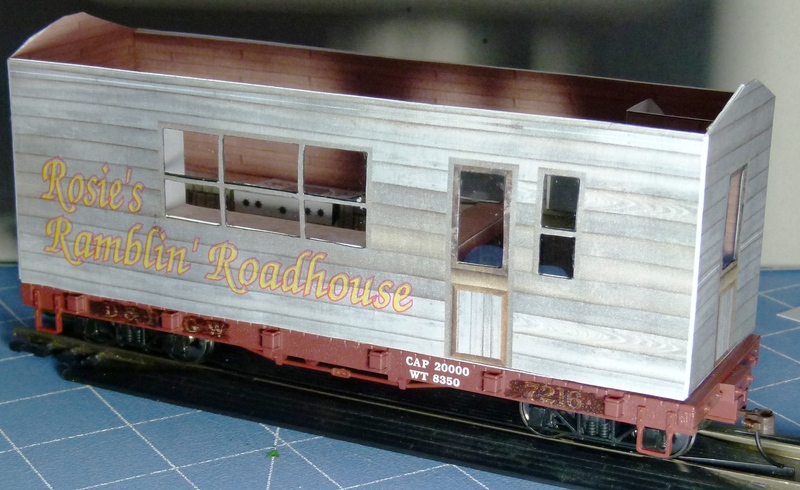 She sold a snug seaside home and commissioned a pair of custom railroad cars. 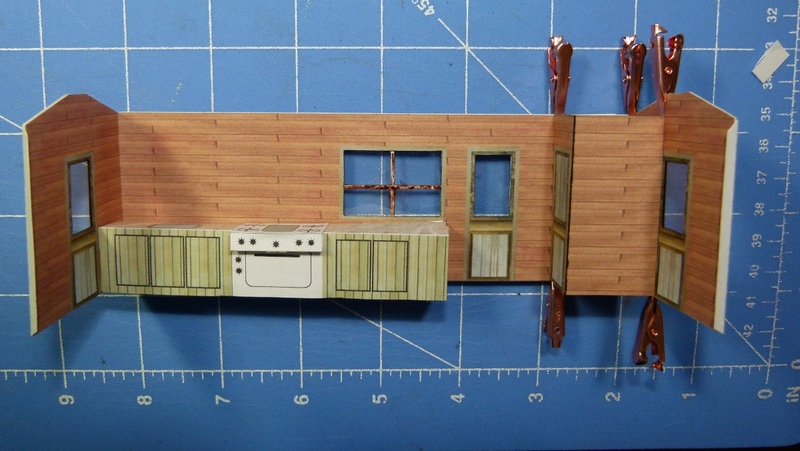 One looked like an old caboose that had been modified into her personal living quarters. The other was a rolling kitchen. It was an instant hit as the B and O added her pair of cars to their regular runs. She had a hot meal for all the workers along the line and even some of the whistle-stop folks looked forward to her brand of gourmet cooking. Here are the first sketches for her kitchen car. This is the rough plan view. And here is what one of the sides might look like. 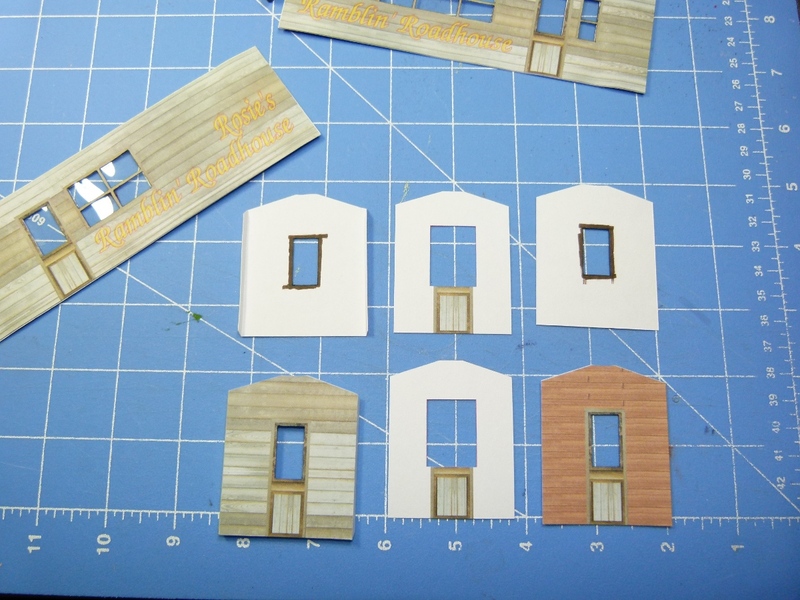 Right now, the plans call for the finished model to have an interior along with clear ‘glass’ in the doors and windows. The roof will come off for show-and-tell sessions. Here’s a few pix showing the bits and pieces I have so far. I’ve already started to assemble them, and as expected, there are a few bugs. I’m going to have to make some separate glue tabs because I neglected to add some that will be critical to the structural rigidity of the car. The image above shows the first print out. Notice it’s four sheets. 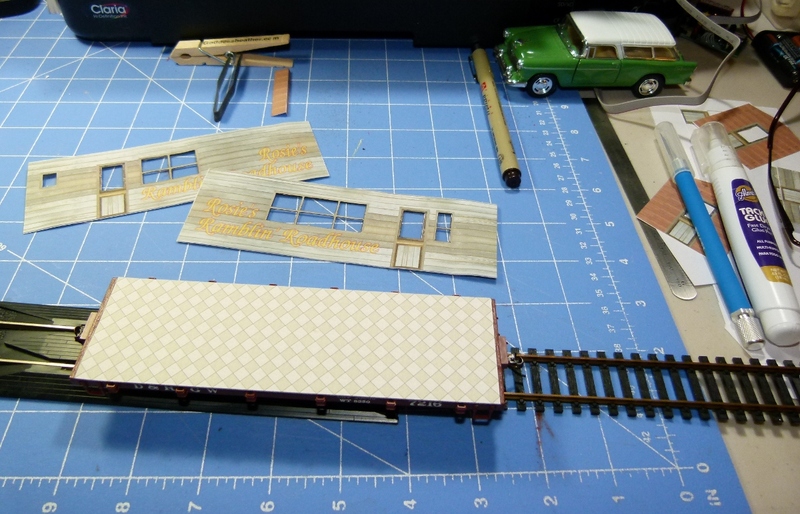 I’m not sure, but I don’t recall ever seeing a flatcar with a deck covered in cheap linoleum. In order to make the window glass look right, all four walls are three layers thick. The cutouts in the center layer are larger than the actual window size so there is a glue surface for the clear plastic sheet. Travel note: This coming weekend, there is an On30 Open House at Steve’s place in West Virginia. I’m planning on attending and with any luck, I’ll have the first (real rough) version of this to show and tell. NOTE: The Open House was a blast! Here are some pix. This shows the gas range, cooking counter area and head. Minus the roof, but enough to give you an idea of what it will look like. I’ve found several ‘bugs’ in the design and will be re-printing it later this coming week. Last night, I printed a fresh set of four pages on cheapo cardstock. I’m not real happy with the printer settings, but this was to test a bunch of physical changes I made to the design and I wanted to assemble it. The first generation was just sitting on a Bachman flat car. I had a freight car frame and a pair of passenger trucks, so I decided to experiment a bit. I had to relocate mounts for the trucks and here’s the quick-and-dirty view. While that was drying, I got out a fresh #11 blade and my trusty steel rules and started cutting. It didn’t take long to make a pile of pretty little pieces of cardstock. 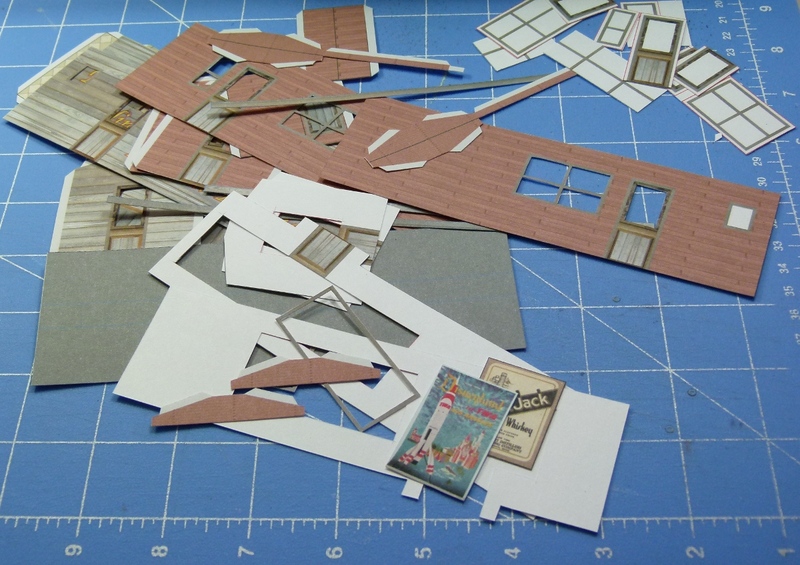 After a short break for some lunch and a fresh drum of ice tea, I started folding and gluing. This next shot has had the color set modified slightly to show off the new frame and trucks. I’m still not sure I like it in comparison to just mounting it on a flat car. I’ll show some more shots on the flat car. Let me know what you think. Here it is on the flatcar again. Rosie stopped in to see how things were going. that’s a great story. hope i get a chance to read it. being both a model rail and sci fi enthusiast I’ll be watching your build. Love this, Anthony, great work. Looks very complex to me.